Even the most indifferent jazz fan has heard of Jazz at the Philharmonic. 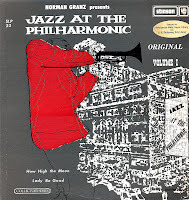 And I daresay nearly every jazz fan has at least one JATP disc in their collection. It's hard not to – there are so damn many of them. The story behind these "jam sessions" is an interesting one. 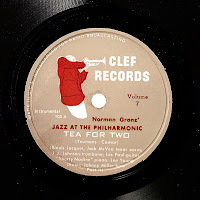 Impresario Norman Granz began organizing casual jams on off nights in Hollywood jazz clubs in the early '40s, featuring musicians who were at liberty and were happy to have a place to play. One stipulation that Granz set was that audiences for his shows be integrated, a demand that was honored by the owners because the jams were so successful. Granz soon began to have bigger ideas. In 1944, a group of Mexican kids were charged with a murder that occurred during the notorious Zoot Suit Riots. Many felt the case was a set-up, and Norman saw an opportunity to expand his battle against prejudice and aid the teens' defense fund while trying out a jam session on an elevated scale. He managed to secure the city's vaunted Philharmonic Auditorium, home of the Los Angeles Philharmonic orchestra, for a single Sunday in July. That afternoon he put on the first of what was promoted as a "real jazz jam session" with an array of stars from his club shows. The audience went wild, of course, dancing in the aisles and cheering the proceedings vociferously. The auditorium's management was horrified, and Granz was barred from ever producing another show there, but history had been made. 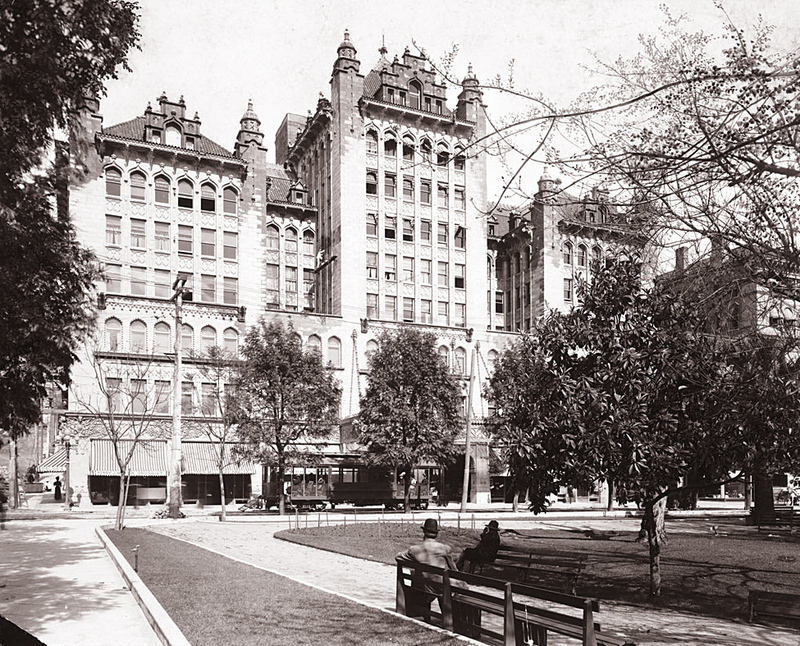 The Philharmonic date would be the first of a seemingly endless string of staged jazz jams, all bearing the original venue's name regardless of location. Granz recorded that first concert and nearly every one thereafter. He issued them all in a confusing series of "volumes," first in multiple-disc 78 rpm sets, then on LP and ultimately on CD. The releases were on the Disc label at first, and then on Mercury, then Clef, Norgran, Verve and ultimately, Pablo. 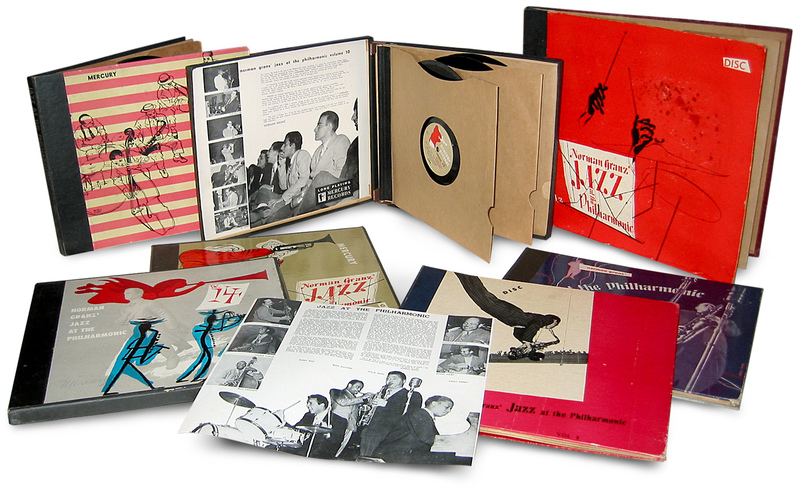 With each label change, the previous JATP volumes were reissued on the new label. 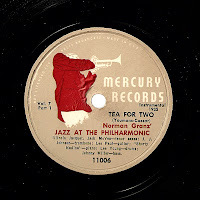 The dutiful collector could own "Tea for Two" from Volume 7 on Mercury, Clef and Verve should he or she care to. To add to the confusion, each title in the early days came out on multiple discs. So "Tea for Two" was broken into parts I-IV in the seventh volume of the series of JATP performances. If you weren't tidy with your records, sides could get misplaced pretty easily. That's why there are so many early JATP sets with missing or incorrect records in their sleeves. Now, all these recordings were owned by Norman Granz – with one exception. That first concert was released by Moses Asch on his Disc imprint. 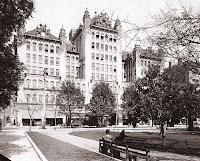 Granz had gone to him trying to interest him in some Ella Logan recordings he'd produced, but Asch demurred. 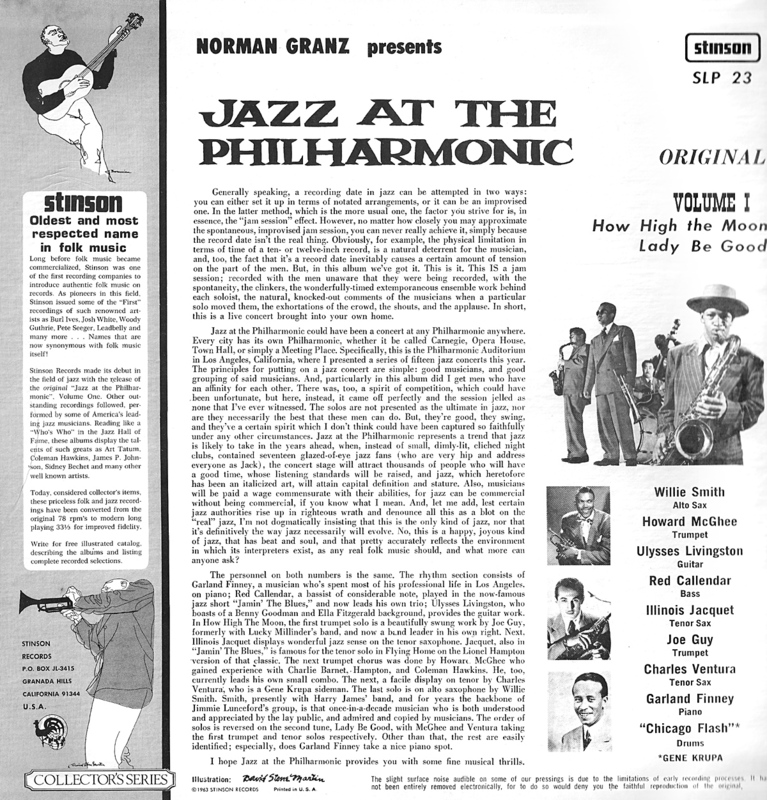 When asked what else he had, Granz pulled out an acetate from the Philharmonic show and Moses had ears for it. So JATP Vol. 1 actually was part of the Asch/Disc/Stinson catalog for many decades. I can only think that this fact must have really rankled Norman, the epitome of the hard-nosed, shrewd businessman. JATP Vol. 1 itself was reissued numerous times over the years. First on Disc and then on Stinson, it eventually came out on LP in the early '60s. I was working in a record store in the early '70s when I got my copy. 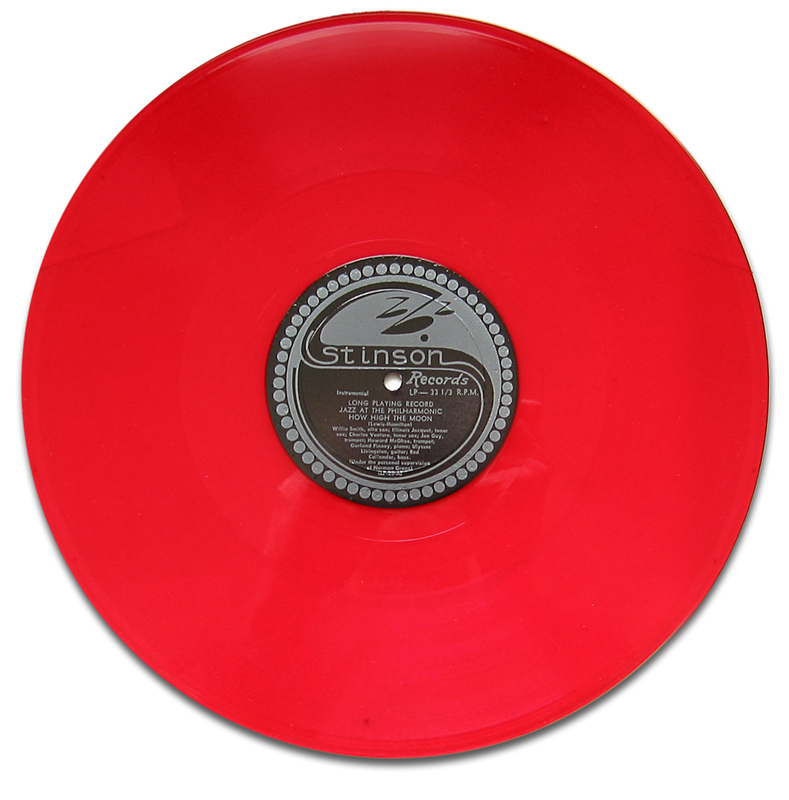 It was the first record I'd ever seen on colored vinyl, and even though it had a paltry 12-15 minutes per side, it was one hard-swinging album. Its featured artists did not include Charlie Parker or Lester Young, as Bird was still in New York and unknown at the time and Lester was with Basie and about to begin his disastrous stint in the Army. But Illinois Jacquet is there doing his best "Flying Home" honking, and Willie Smith turns in a stunning performance. 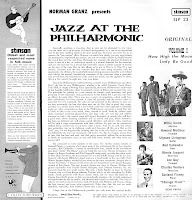 Howard McGhee was in California with Coleman Hawkins at the time, and here lays the bop groundwork for Diz and Bird who would arrive the following year. And there's a guitarist whom most jazz fans won't recognize but who has chops to spare. His name is Ulysses Livingston, and he'd been with Fletcher Henderson, the Spirits of Rhythm, the Hawk and Benny Carter. He sounds quite a bit like Charlie Christian and has a very modern sense of harmony. One other thing. 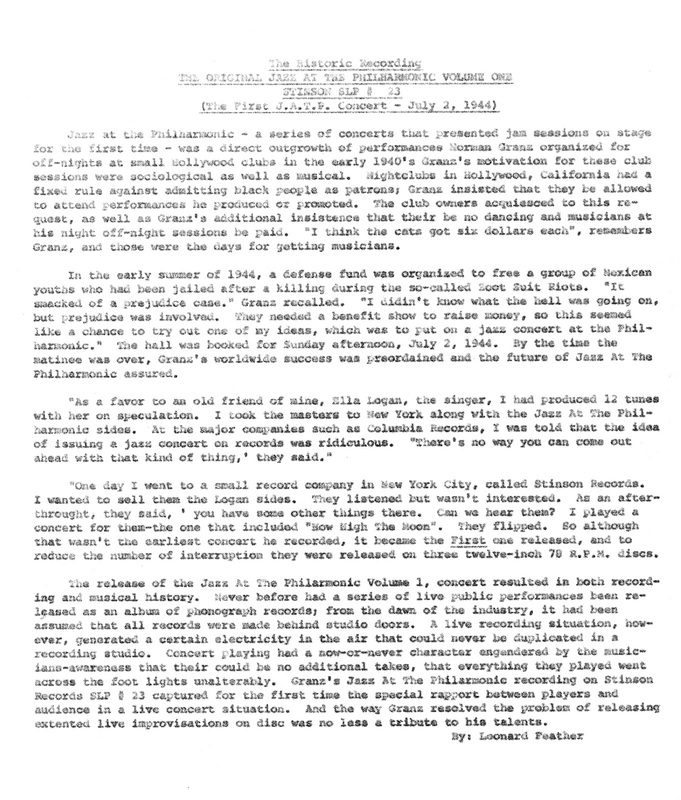 Included in the Stinson JATP record was a brief essay by Leonard Feather on the genesis of that first concert. What is curious about that is the fact that it is a carbon copy of a typed sheet on onion-skin paper. Did Stinson have some sort of antediluvian typewriter that hammered out originals and half-a-dozen carbons in a single pass, whereupon some assembly-line grunt stuffed a copy into each album jacket? Or was this LP meant for some jazz critic with a special note from Leonard tucked into it? We'll never know, and I've never seen this article anywhere else. But here it is for you to check out. Another one more thing. If you're a stone Prez fan, you know about "Jammin' the Blues." But if you've never seen the Gjon Mili film, you're in for a treat. 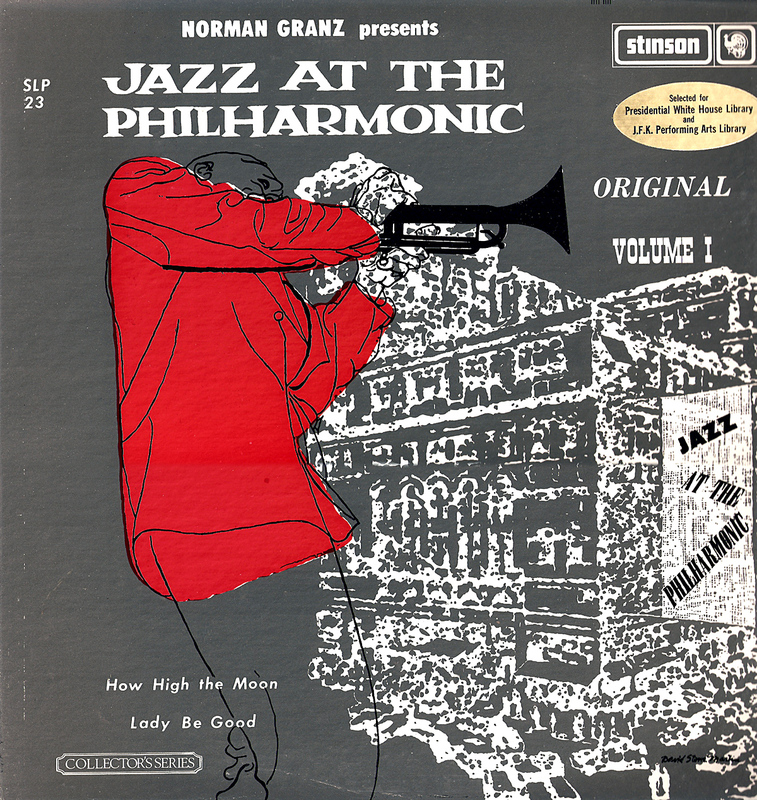 Norman Granz did the A&R work for it, picking the musicians and selecting the tunes. His inspiration, of course, came from those Hollywood club sessions and the JATP concert. The ironic thing is, even with the editing and blocking involved in the film, the music probably comes closer to the sound of a true jam session than anything that ever happened on a JATP stage. Here's the film in high-def, courtesy of uiramoreno and YouTube. Lester is the epitome of cool, and watch closely when Big Sid hands the drums off to Papa Joe. As Luca, my Swiss alto-playing friend says, "Keeling!" As always, these music files were ripped from the original vinyl with only a mild cleaning of pops and clicks. 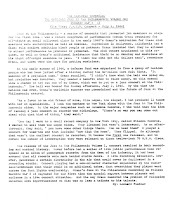 Howard McGhee, Joe Guy, tp; Willie Smith, as; Illinois Jacquet, Charlie Ventura, ts; Garland Finney, p; Ulysses Livingston, g; Red Callendar, b; Gene Krupa (Chicago Flash), d.
First of all, I love your blog. You continue to share some amazing things and I really appreciate your efforts. As I read through this posting something wasn't hitting me right. Finally I pulled out my complete JATP on verve and took a look at the songs and personnel. It hit me quickly. Nat "King" Cole is all over the 1944 original JATP performances. He isn't listed on your personnel for these tracks. I dug further and found that personnel and those tracks listed under the Feb. 12, 1945 JATP at the Philharmonic Auditorium in LA. I am not able to read the back cover of your posting, which may have the information you list along with the date. I wanted to present you with this other date and let you know that the listing may be incorrect. I appreciate your response. I'm glad we could come to agreement on this one. I am very excited to see what you will be sharing next!